When the time comes for a trip to the dentist, some of your younger family members may be less than enthusiastic. In fact, they may feel downright panicked. 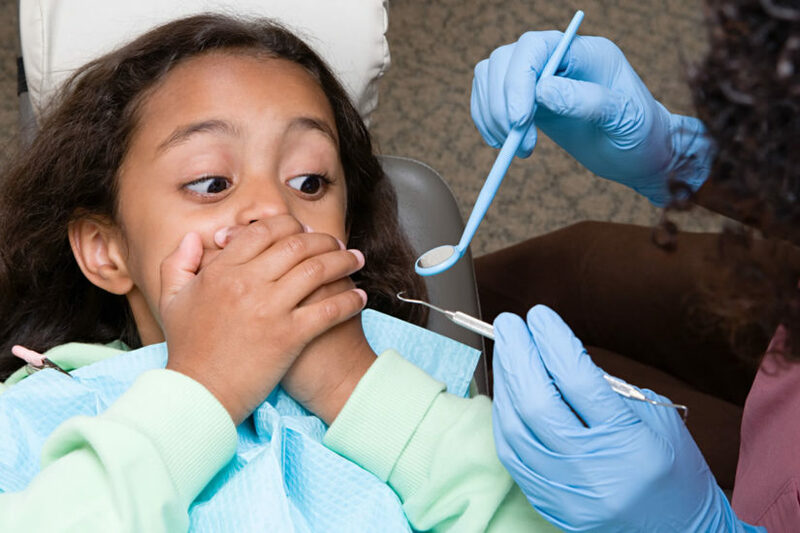 Many children feel anxiety about going to the dentist, with emotions ranging from mildly reluctant to extreme fear brought on by just the thought of sitting in a dental chair. It’s important to help your child have the most positive experience that they can while at the dentist. Being comfortable allows them to build healthy associations and create good oral care habits they can take with them as they grow. Here are some tips for you to try out to help manage your child’s dental anxiety. If you experience anxiety when you visit the dentist, you may be passing along your fears to you child without noticing. Be aware of your behaviours and the language you use when around your kids before and after visiting the dentist. If you talk about how much you dislike the experience, exhibit physical manifestations of fear, or communicate other negative feelings you may have about your dental visit to your child, they may interpret this as normal behaviour and could end up reacting the same way. Whatever the reason for your own dental anxieties, try not to instil them in your child so that they learn to see regular dental visits as a normal part of their health care routine. Having your child visit the dentist regularly as soon as their first tooth appears allows them to grow up with the experience and get used to it. Having regular routine checkups are the best way to help your child grow accustomed to the dental office and learn to trust their dentist. Having your child see the dentist’s office as a normal environment that they can feel comfortable in will help keep anxieties at bay. “Dental play” refers to bringing the world of the dental office into your home, in a comfortable and playful way. This can be done by playing dentist with each other, allowing them to take on the role of the dentist and “check” your teeth. You can also read children’s books about positive visits the dentist that explain what happens in an entertaining way. Bringing the idea of the dentist’s office home and associating it with positive experiences is a great way to help your child see dental visits as normal occurrence. It may seem like an easier option to not tell your child that they are seeing the dentist until just before their appointment. However, this can actually cause more stress in a short amount of time, resulting in something resembling an anxiety or panic attack. This can also result in a loss of trust in you if they feel attacked or surprised. Tell your child ahead of time when they’re seeing the dentist so that they have time to mentally prepare and process their emotions. Allowing them this time also lets them think of any questions that they may have before they get into the dentist’s chair, giving you the opportunity to address their concerns. When your child asks a question about their oral health or upcoming dental checkup, try to answer honestly, and as positively as possible. This means that you should try to avoid using blanket statements such as, “You’ll be just fine” and instead tell them what is going to happen in a way that’s positive and they can understand. For example, you could explain to them that the dentist wants to see how well they have been brushing their teeth or that the dentist wants to count how many teeth they have. These statements are truthful, easy to grasp, and do not promise they won’t need a dental procedure, just in case they actually do. Communicating with your child in this way gives them the opportunity to trust you and learn more about why they are visiting the dentist in the first place. Going to a dental office that caters to children is a great option. Family and pediatric dental professionals are trained and experienced in dealing with young people and often have offices and examination rooms that are brightly coloured or decorated in cheerful ways to cater to children. If you do not currently have a family or pediatric dentist and would like to explore one open near you, visit 123Dentist’s comprehensive list of dental offices in the Lower Mainland.